To underline how climate change must become everyone’s issue, we asked writers on beats not usually concerned with extreme weather to weigh in. 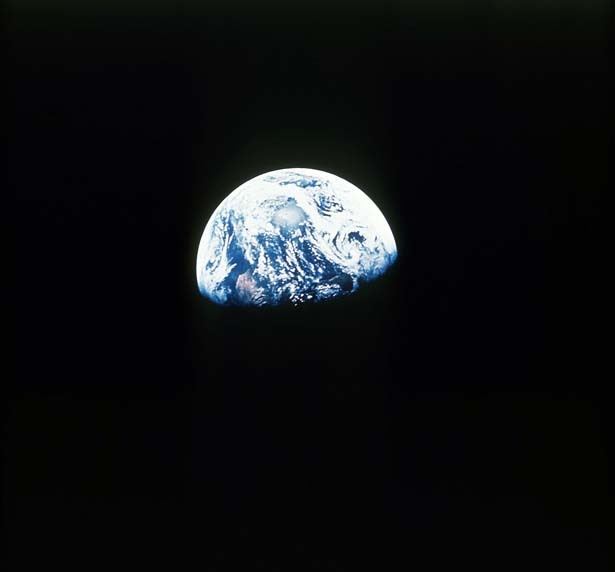 View of the earth from the moon, taken from Apollo 11 in July of 1969. Just in time for Earth Day comes a fresh sign of the growing strength of the grassroots climate movement: the Obama administration announced on April 18 that it would delay yet again a decision on the Keystone XL pipeline, probably until after the November elections. Delay is not victory, and Big Oil and its friends in high places will continue insisting that the project go forward. But make no mistake: Keystone XL would have been approved years ago if a feisty popular movement of farmers in Nebraska, indigenous peoples in Canada and environmentalists across the United States had not marched, filed lawsuits, gotten arrested and otherwise opposed a pipeline that would bring to market some of the most carbon-intensive oil on earth. The longer Obama’s decision on Keystone is delayed, the better. Delay gives activists more time to educate the public about this suicidal folly and above all to build an even larger, more cantankerous grassroots movement—which, as the unsung history of Earth Day suggests, is the key not only to defeating Keystone but to winning the larger battle for climate survival. Toward that end, The Nation is marking Earth Day 2014 with special, wall-to-wall coverage of the climate challenge. Every piece of content on TheNation.com today will focus on climate change, its implications and solutions. “Nobody on this planet is going to be untouched by the impacts,” Rajendra Pachauri, chair of the UN Intergovernmental Panel on Climate Change, said on March 31, when releasing the latest scientific report on how climate change is already causing great suffering and economic disruption around the world, with much more to come. To underline how climate change must become everyone’s issue, The Nation is publishing articles not only by seasoned climate reporters such as Naomi Klein, Chris Hayes and Wen Stephenson but also by contributors from beats not usually associated with rising temperatures and extreme weather, including Katha Pollitt, Dave Zirin and Mychal Denzel Smith. One reason the climate movement isn’t bigger is that many Americans still regard climate change as “just” an environmental issue. In particular it is time for progressive activists and organizations to grasp that climate change is increasingly affecting their own concerns, from economic justice and immigration to human rights and foreign policy. Growing a larger grassroots movement is vital because the history of Earth Day teaches that public protest, more than public opinion, is what delivers progress. On the first Earth Day, in 1970, 20 million Americans took to the streets to demand action, and to take action themselves: planting trees and gardens, educating voters and schoolchildren. This outpouring of organized mass sentiment led a Republican president, Richard Nixon, to create the Environmental Protection Agency and sign laws that still provide, on paper, the strongest environmental protections on earth. Nixon did this, we now know from his aides’ memoirs, not because he cared about nature—the man wore wingtips when walking on the beach—but because he feared that the aroused populace he witnessed on Earth Day could jeopardize his re-election. But congressional Republicans and Fox News aren’t the only ones who deny climate change. Many others engage in “soft denial”—refusing to face the climate crisis because it’s too disturbing. “I just can’t go there,” the mother of a 7-year-old recently said. Many parents may sympathize with that sentiment, but we must rise above it. If a doctor diagnosed our kid with a potentially fatal illness, we might weep privately, but wouldn’t we then spring into action, doing all we could to give our son or daughter the best possible chance of survival? This is the dilemma we as a civilization now confront. Our scientists are warning as plainly as they can that all we hold dear will perish if we continue our current trajectory. They also say we have the tools needed to turn away from death and instead build a brighter future. The hour is desperately late, but this choice is still ours to make. Let’s roll. Michelle Chen: Where Have All the Green Jobs Gone?